I read a book by an Evangelical author that said there is very little of Jesus in the Rosary. Many Evangelicals think the Rosary is "all about Mary" or that the primary focus of the Rosary is on Mary. I've done a little counting. I understand that it is kind of a “heady” examination to count verses but I can assure you, it is the first time I have ever done it. Usually the Rosary is a very organic thing for me. Kind of like when I memorize a great worship song. So at the risk of highlighting the dreaded “repetition” factor of the Rosary, let’s do some counting just for interest sake to see what percentage is about Jesus. In summary: the Rosary is 65% directly to Jesus and about him. It is 35% honouring and requesting prayers from Mary, his Mother. 88% of the Rosary is directly from the Bible, 12% is from the wisdom of early Christians. There are two layers, the meditation layer and the physical layer. Each decade of the Rosary focuses on a section of Scripture as a meditation. These are called the mysteries. Out of 20 meditation decades (5 are done each day) 18 of them follow Jesus through the Bible and two are related to Mary (Assumption and Coronation). Meditations are 20 Mysteries: 18 Excerpts from the Bible (0.9) + 1 Based on the Bible (Coronation) (0.05) + 1 From the catholic tradition (Assumption) (0.05). The Rosary starts with the Apostles Creed which is accepted in most denominations. It is 15 lines long, all of them scriptural. The “Our Father” is repeated before each decade (6 times). It is approximately 11 lines of text (in most Bibles). That is 36 lines of “Jesus” text. (Said after each decade)” This is said 5 times and is four lines long for 20 Lines. The “Hail Mary” is 5 lines long but besides being mostly direct Scripture, line 3 is specifically about Jesus. The Hail Mary is said 53 times. Here’s the math. 15 lines of the Creed + 36 lines of the Our Father + 24 lines of the Glory be + 20 lines of the “Oh my Jesus”+ 53 x 1 line addressed to Jesus in the Hail Mary = 148 lines "to Jesus"
15 lines from the Creed + 36 from Our Father + 212 from Hail Mary + 24 from Glory be (Fil. 4,20) = 287 lines based on the Scripture. 142/360=0.39. 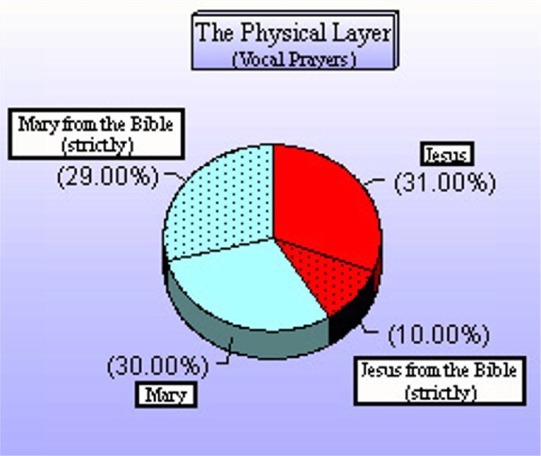 Thus, the all physical layer is configured by 39% of prayers which are excerpts from the Bible. 287/360=0.80 Thus, the all physical layer is configured by 80% of Bible based prayers. 65% is addressed to Jesus (15% Bible Text) and 35% honouring and requesting prayers from Mary (28% Bible Text).